Above photo: Showcase collection of intricate and moveable 3D Printed goods in acrylic, stainless steel. 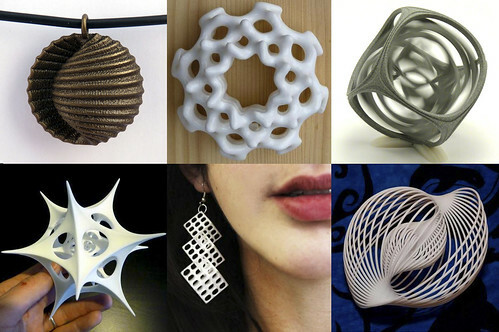 Designs by famed Dutch designer, Virtox, using Shapeways, 3-D printing-as-a-service and marketplace of designers. One Liner: The crowd is becoming like a company in the Maker Movement. 3D printing rapidly accelerates it. Find your company’s place in the ecosystem with these five business models. This is the next phase of social business. Just as many people who have published blogs, videos, and pictures have become media companies, we’re now seeing people make physical things and personally become like traditional companies. In both phases, the rules are the same: those who stand in the way will get pushed aside. Those who enable, will benefit. Welcome to the Maker Movement, where communities crowd-fund, design and produce goods, then host their own global marketplaces for trade. New technologies like 3D printing will quickly accelerate this trend. The industrial revolution is repeating, but at a personalized level. The movement is accelerating as 3D printers enable Makers. Here’s a few cherry things that have happened in the last few weeks: Printing giant HP has announced they will enter the 3D printer market next year. A metal gun was 3D printed in Texas last week. A Paris fashion show was dedicated to 3D printed apparel. A father takes medical care into his own hands, and 3D prints a hand for his special needs son. If those examples don’t get you, you can now print in wood, salt, ceramic, gold, proteins, and most magically, chocolate. Yes, I said chocolate! There are significant changes coming to business models. I’ve taken classes at TechShop, visited Shapeways a 3D printing factory, and have a number of 3D printed objects at home. I don’t consider myself an expert at the technology itself, but I am focused on the impact to business models and the relationship between customers and companies. What will be the impact of 3D printing on business? There are five business impacts: 1) 3D printing is going to force changes in business models and commercial laws, including liability and IP rights. 2) Local production is going to cause rifts in traditional supply chain management and global logistics. 3) On-demand printing will effectively reduce the need for large inventories, reducing many costs from warehousing to inventory taxes. 4) Personalization of goods will disrupt mass standardization. 5) Unique and complex goods that never existed before will be printed. With these many changes coming, companies need to develop new corporate strategies. To help, I’ve simplified the five business opportunities, which large companies can tap into now. Here’s a helpful guide to get your company on the right path now. 1) Financial Backer Invest in startups, sponsor them, or acquire players. Philips was an early investor in Shapeways which continues to grow as a 3D printing service. Autodesk, Intel, and Lowe’s sponsors TechShop, a maker studio across the United States. Corporate development investments have exceeded venture capitalist investments over the past years. Many startups are seeking monies direct from large companies. 2) Manufacturer Produce 3D printing hardware and components or create the software that makes them work. Autodesk, a leader in 3D printing software has lead thought leadership, built an amazing gallery in SF, and hosted events on this topic. Intel, Google both feature 3D printers at their developer events. Even if you don’t manufacture 3D printers or their software, integrate how those can be tucked into your business model for employees, and new services for customers. 3) Supplier Produce and distribute filament composite materials that will be used in the process on an ongoing basis. Become a supplier of 3D printed files (STL) or IP. Companies who currently produce goods can refunnel supply chain to produce spools of materials used by 3D printers. Also see how Nokia served up digital files so communtiy could 3D print cases for phones. Companies who seek to release 3D printed files should release files that don’t cannibalize their own revenue as an unintended consequence. Nokia’s release actually disrupted their partners. 4) Marketplace Host an online marketplace of designers, printers, products and service providers. Currently, the largest marketplace is Thingaverse where STL files are being uploaded and shared. New 3D scanners are emerging, enabling people to scane physical goods then re-print them out to their liking. Remember how Napster met quick federal walls and new models, like iTunes, emerged, shifting Apple to hardware company to value-added media marketplace. 5) Service Provider Provide education, printing as a service, customization, design services, or delivery in this broader ecosystem. Shapeways (backed by Philips) is a printer as a service. Techshop (backed by Intel, Autodesk, and Lowes) teaches Makers new skills. Retailers can create customized, value-added products that expand their brand and product offering. Just as Target and Walmart have photo services in retail stores now, expect to see 3D printing services emerge there for customized goods on demand. The impacts to 3D Printing has broader ecosystem impacts. So who will be impacted? People who make physical goods from any material will be impacted. Any company that makes widgets or parts without a broader value-added service or prestige brand or community will be impacted. While the physical goods manufacturers are certainly at risk, there’s an ecosystem impact that shifts: global shipping, and thus need for oils, could be radically altered as goods are printed at local level. If complex goods can be printed – instead of assembled – there will be significant impacts to emerging markets in Asia, South America, reducing the need for even expert manual labor. Of course, this has broader impacts to oil usage of shipping, and even military bases protecting investments. It’s bigger than it looks.